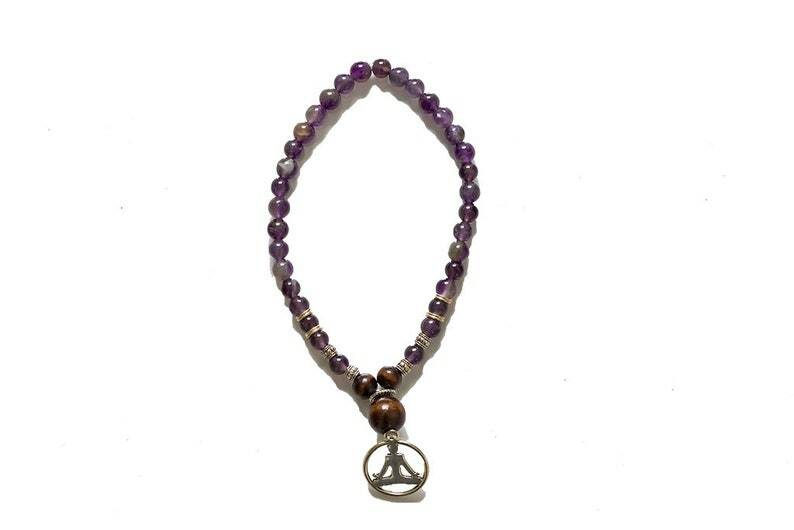 Mala Bracelet - "Gentle Serenity"
Amethyst is the stone of serenity. Amethyst is one of the most spiritual stones as it promotes calm, balance and peace. It is excellent in enhancing spirituality and intuition. This gemstone inspires an enhanced the higher mind and meditative state, strengthens the imagination and helps put thought into action. Dark Wood has both feminine and masculine energies. It is an energy balancing mala that will get you back into optimal alignment with your higher self. Dark wood helps to ground you when you become to externally focused. Mala Bracelet - "Gentle Intuition"
Mala Bracelet - "Centered Alignment"
Mala Bracelet - "Centered Intellect"
Mala Bracelet - "Centered Relaxation"
Mala Bracelet - "Gentle Awakening"
Mala Bracelet - "Gentle Purpose"
Mala Bracelet - "Centered Security"
Mini Mala - "Magically Lunar"
Mini Mala - "Zenfully Clear"
Mala - "Mind At Peace"
Mini Mala - "Classic Harmony"
Mini Mala - "Zenfully Elegant"